Elan Group has achieved yet another milestone on its journey of developing excellence, announces Elan Miracle. Elan Miracle is Situated at a wonderfully & strategic location on the crossing of the most desired lifeline Road of Gurgaon Sector 84 called the Dwarka Expressway & Multi Utility Corridor. Spread over 7 acres of land Elan Miracle has 135-meter wide road in front of it. Elan Miracle is a mixed used development project with the tallest iconic building, having been designed by “UHA LONDON” one of the best building designers of the world and the compliment the above we have empanelled “Design Plus” as architects who are known for the excellence in their field. Situated in an amidst dense representational area been developed by names like DLF, Vatika, Bestech, Spaze etc offering approximate of over50000 apartments. Elan Miracle also offers 11% Fixed Return with Bank Guarantee Pay in ESCROW Account to its investor’s accompanied with the appreciation factor while disposing of. Elan Miracle has hired JLL as their leasing partner and offers superplex by PVR. Elan is emerging as an Indian realty major; fully capable of delivering great value to its clients. Through wide-ranging expertise, Elan Group is all set to offer unique residential, commercial and hospitality projects. The group aims at creating a connection between discerning individuals and intelligent spaces to create exciting new prospects in developing India through innovations, new technologies, and research. Since inception, we are persistently focused on continuing to create and build spaces that can transform lives for a better tomorrow and a better world around us. The company has strong presence in northern India, specially Delhi / NCR, with projects at the best locations of tier 1 cities. Lower Ground Floor dedicated to Hypermarket with two major Anchor Stores – 1.75 Lac sq.ft. Ground Floor dedicated to Retail Shops plus Anchor Stores -1.60 Lac sq.ft. First Floor dedicated to Retail Shops plus Anchor Stores – 1.30 Lac sq.ft. 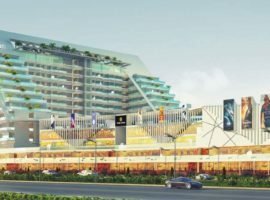 Second Floor dedicated to Food Court & high-end Restaurants – 1.50 Lac sq. ft.
Third, Fourth, Fifth & Sixth Floor dedicated to India’s Largest Superplex by PVR with 18 – 21 Screens (4000 – 4500 seating capacity) – 1.50 Lac sq. ft.
Third Floor also dedicated to Entertainment Zone – 40,000 sq.ft.